Loss. Betrayal. A train station in the dark of night — a woman in a red dress. Money on the horizon. A gun. It’s the breeding ground for a crime of passion, the set-up of a classic film noir. But then… if this is the last scene on the screen, it’s the beginning of another story. Take a well-practiced knowledge of genre films, add to it a strong working theory of what the moving image can do to place a country face-to-face with itself, and bring to these a nose for gifted and committed actors and crew, and you have Christian Petzold. Add one more element — an unforgettable display of the power of song — and you have Phoenix. In 2012 Petzold brought us Barbara, the lushly romantic period drama of 1980s East Germany that won him the Silver Bear for Best Director at the Berlinale. His follow-up, which actually moves him backwards in time, is Phoenix, at least his fifth screenwriting collaboration with his one-time professor, the late Harun Farocki, who was a prolific filmmaker in his own right, and his sixth collaboration with the ever mesmerizing Nina Hoss, who won a Silver Bear for her acting in Petzold’s 2007 film, Yella. Since the mid-90s, Christian Petzold has been one of the leading lights of what came to be called the “Berlin School” of independent filmmaking in Germany. His films have always enfolded the personal in the political; consider The State I Am In (2001). At least three of his latest have reworked American classics, such as Yella (referencing Carnival of Souls, 1962) and Jerichow in 2009 (nodding to The Postman Always Rings Twice, 1946.) His sources — horror films, mysteries, thrillers, film noirs — relied heavily on atmosphere, photography, and acting for their psychological impact rather than plot, action, and special effects. Petzold took on the challenge of making them highly relevant to Germany’s state of affairs in the conflicts they portrayed. Decades after the postwar era when both Hollywood and France championed the film noir as pulpy-popular cinema with style, feminist film theory claimed it as a ground for fascination with its relative empowerment of women. Out-of-bounds as they were with their behavior that exceeded the limits of the bourgeois family edifice, the female characters used their “excessive” sexuality to stand up to men. Some in trench coats with pistols but most in veiled hats and stilettos, they sauntered through smoky night clubs and dark alleys with or without their shady escorts, on the prowl for money and power as much as their men were. Feminist critics who complained how “real” blood-and-guts women (fully developed, complex characters) had disappeared in the Hollywood gaze that turned them into virgins, madonnas, or temptresses (sweethearts, mothers, or whores) claimed that the femme fatale was no longer “disembodied” from the narrative via her structured absence or, at best, her off-screen voice: she was given a physical, social space of her own. She motivated the camera as it followed her into suspenseful dark places; she “called the shots.” Hedy Lamarr and Marlene Dietrich are referenced in Phoenix; film-savvy viewers will discover layers of resonance with others. But Nelly doesn’t look like a “spider woman.” A chanteuse with her piano-player husband Johnny in London, she returned with him to Germany, their homeland, in 1938 when her good friend Lene, a successful attorney, had enough foresight to stay out. It’s Nelly who’s trapped, then — arrested by the S.S. and sent to Auschwitz, where gunshot wounds disfigured her face just before her liberation. As the film opens, Lene is escorting her to a reconstructive surgeon in Switzerland where Nelly hopes to recover the image of herself she has lost. “That is not recommended,” the doctor tells her. “A new face is an advantage.” Phoenix plays out the meaning of that loaded and double-edged claim. 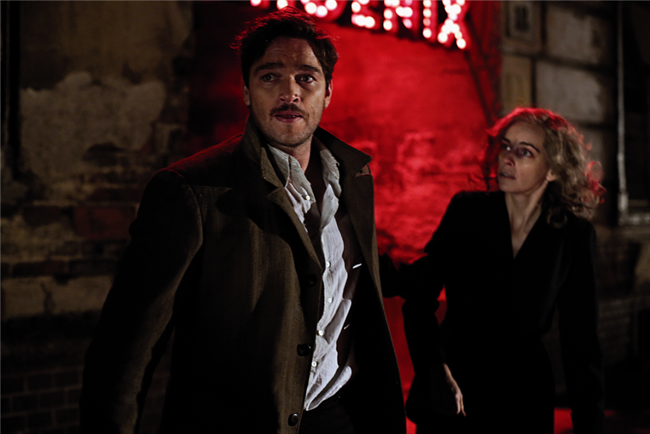 “Phoenix” is the name of the night club where, in 1945 Berlin, Nelly goes looking for Johnny once her bandages come off. Several performances of two female cabaret singers who dance as doubles are cleverly cross-cut with Nelly’s attempt to make eye contact with the man she loves, but the man she finds works as a busboy and goes by “Johannes.” He doesn’t see her as Nelly — at least not yet. When that happens, it comes in a perverse way. Johannes speaks of Nelly as the celebrity singer who died in the camps; now he wants to raise her from the dead, so to speak, by passing off this “look-alike” as his legal wife who survived after all. Because she bears an uncanny resemblance to the beloved crooner, the public would know them as Johnny and Nelly, and they would perform in the cabarets now filled with American soldiers. They would build a future from the ashes. Duplicity, disguise, and deception are what Johannes has in mind. Somewhere in Nelly’s heart, she knows this. But for now, still in the dizziness of her trauma,at whatever cost, she needs to believe that Johannes is Johnny, that he will come to recognize her, that he will then love her as he always did, and that her life will be once again as it was. To play his game, she tells him she’s “Esther,” and he proceeds each day to transform her, little by little, from the woman she is, whose entire life — physical, psychological, social and emotional — has been demolished, to the object of his desire, a flame whose singing will light up the clubs as he rakes in the loot. There is also what Johannes knows but doesn’t tell Esther — for one thing, that all Nelly’s relatives were killed in the camps, all but one, who was her kin only by law. But that was then…. For the time being, Nelly is consumed by her role as Esther and does her best to reclaim any last vestige of her identity, one that will restore her to Johnny, whose love was all that allowed her to survive, she tells herself. Johannes brings her Nelly’s color of hair dye, make-up, dress. He teachers her how to walk, how to sign her name. And she tells Lene, “Johnny made me back into Nelly. Sometimes I get really jealous of myself — of how happy I was.” Meanwhile, as the ghost of herself, she haunts Johannes. But the days go by without a spark of empathy, compassion, or even curiosity. About her past, “No one will ask. No one wants to know,” Johannes tells her. Particularly not Johnny. Nelly clings to him as a scaffold for piecing herself back together, speaking of herself as another person, some kind of mannequin that he will bring to life. It’s brutal to watch, because all this while, he struggles to repress any memory of her, his feelings, his actions. 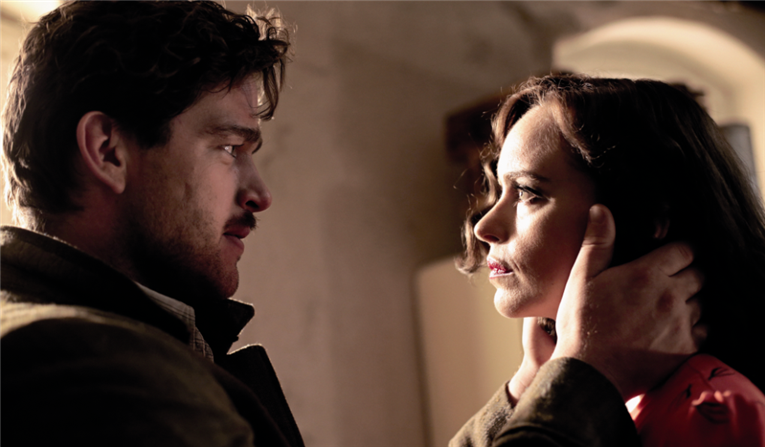 What do we make, then, of Petzold’s Nelly? Is she buttressed or devastated by her friend Lene, who insists that she take her family inheritance to Tel Aviv or Haifa where they can build a new life.? Is she puddy or power in the hands of “Johannes,” whose plan is to flee into the future? What is the play of this triangle in the shadows? Petzold, who has always been drawn to the possibilities of genre films, also succeeds here as Douglas Sirk and his follower Fassbinder did, both who made powerful use of the melodrama in compelling our piercing empathy with the character who suffers the confines of an unnatural order in a so-called moral world. 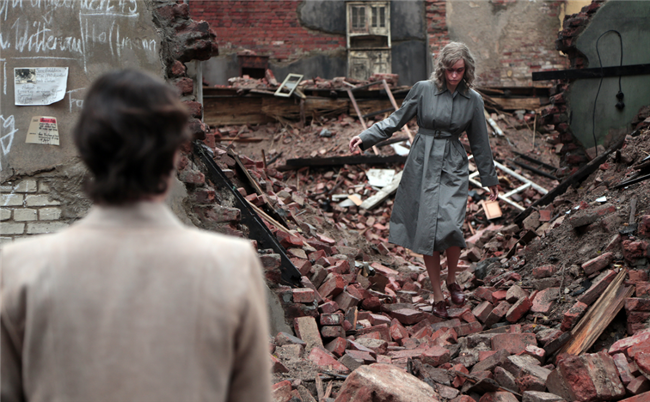 A certain romantic leap of faith facilitates that empathy, and Nina Hoss as Nelly embodies it to the utmost. Ronald Zehrfeld, playing Johnny, harbors with perfection the Zvengali-like master who would keep his blue chip in tow. Widescreen lensing by Hans Fromm makes elegant use of CinemaScope (a first for Petzold) for expansive location shooting in Brandenburg and Wroclaw (Poland) capturing the night’s shadows that follow Nelly to the cabaret and “home” and also the distances that separate her from old acquaintances once emerges in the light as “the old Nelly.” K.D. Gruber’s production design is at once spare and poignant, morose with an atmosphere of char and rubble, reclusive and claustrophobic in Johannes’ cellar apartment, but also bright and hopeful with the warm-hued parquet floors and old-time turntable in the quarters Lene finds for Nelly. Bettina Bohler’s editing punches metaphorical meaning into cabaret routines by juxtaposing song lyrics and choreography with Nelly’s and Johnny’s sordid hide-and-seek game. The sober jazz score composed by Stefan Will, with its slowly plucked bass sounding low and alone, is just enough to contrast with the escapist song-and-dance routines on the cabaret stage and to prolong the heartbreak of Ogden Nash’s and Kurt Weill’s torch song, “Speak Low,” in which Nelly melds the past, present, and future in a single sigh. If she gives up the ghost, both as “Esther” and as Johnny’s beloved, and still hovers over the ashes of a land laid to waste by itself and others, something unmistakable keeps her spirit alive: Nelly has a voice. Phoenix ends with a performance that haunts us long after the lights come up; it illuminates this masterful film noir for days to come. Director: Christian Petzold; Producers: Florian Koerner von Gustorf, Michael Weber; Screenplay: Christian Petzold, with the collaboration of Harun Farocki, based on the novel, Le retour des cendres by Hubert Monteilhet; Cinematographer: Hans Fromm, BVK; Editor: Bettina Böhler; Sound: Andreas Mucke-Niesytka; Sound Designer, Dominik Schleier; Music: Stefan Will; Production Designer: K.D. Gruber; Costume Designer: Anette Guther. Cast: Nina Hoss, Ronald Zehrfeld, Nina Kunzendorf, Trystan Pütter, Michael Maertens, Imogen Kogge, Felix Römer, Uwe Preuss, Valerie Koch, Eva Bay, Jeff Burrell, Nikola Kastner, Max Hopp, Megan Gay, Kirsten Block, Frank Seppeler, Daniela Holtz, Kathrin Wehlisch, Michael Wenninger, Claudia Geisler. Color, 35mm, widescreen, 99 min. In German and English with English subtitles.